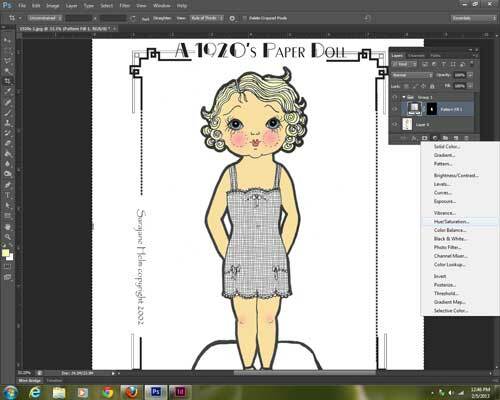 Here is a tutorial on using Adobe Photoshop to create full color paper dolls, beginning with the scanned black and white art I drew by hand for these 1920’s style dolls. 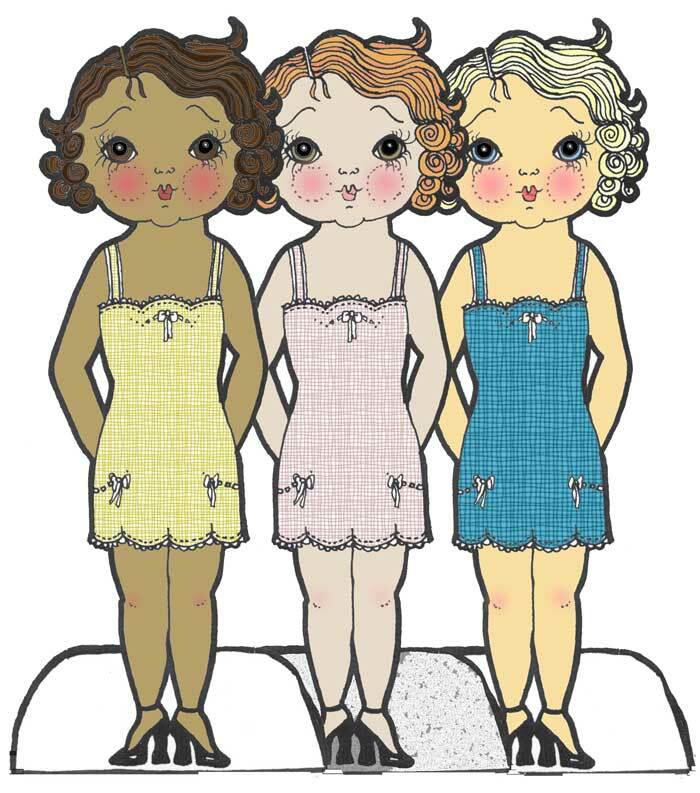 I drew a series of historically accurate paper dolls, ranging from Ancient Egyptian to 1970’s for my own coloring enjoyment,, and the paper doll .pdf files are also available for purchase and instant download from my Creative Connections Etsy store. 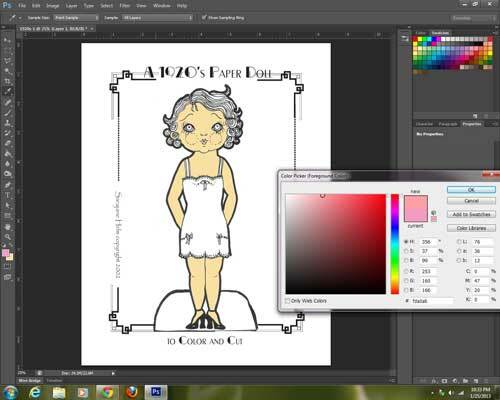 Coloring with the computer can be even more fun than using paints, pens, and pencils. With millions of colors, textures, patterns and gradients, it’s a whole other art form. 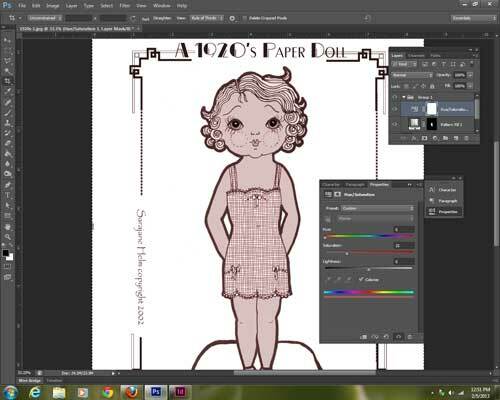 Start by opening Photoshop and then choosing File>Open to browse to the .pdf file containing the paper doll images. Make sure that under Select you choose Pages and click on the page you wish to open. Here I have selected Page 1 and the print resolution is 300 ppi, just right for printing the final image when we’re done. Click OK. 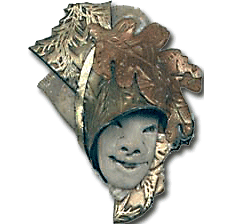 Page one opens up with the doll and fits on the screen best for use starting at 25%. Right now at the beginning is a good time to go to File>Save As and save the image as MyName-Doll-1 or something like that, so that you have a different copy of the file for each time you color. In this screen shot, you can see the colors pallet open at the top left of the screen. If this isn’t open already, look on the top tool bar under Window>Color. You can choose Swatches right next to Color and use the cursor to click and pick colors. Or, you can double click on the foreground swatch of color (the one on the top left of the two little squares) at the bottom of the left hand tool dock and bring up the color picker as seen here. 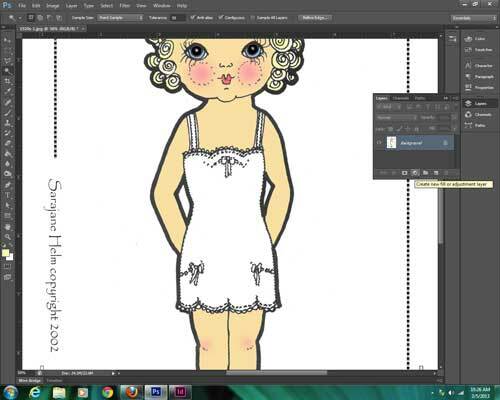 Move the spot until you have a color you like for the skin tone and click to choose it. Then click OK or Add to Swatches so you can find it in the swatches pallet again if you need it later. 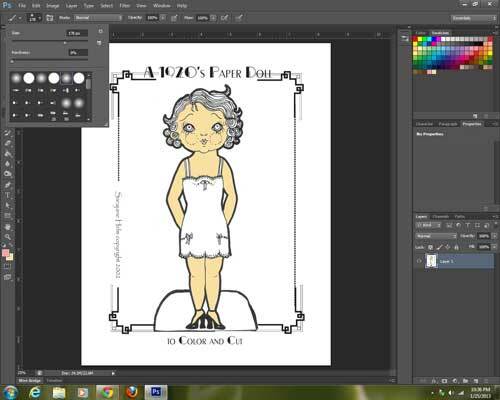 You can also use the eyedropper tool to duplicate a color, if say, you forgot to do the feet and noticed at the end. With your cursor, click to choose the paint bucket tool from the left tool dock. It shares a spot with the gradient tool. 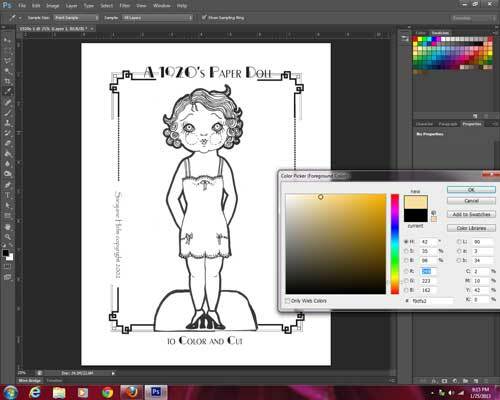 Then, move to the part of the doll you want to color and click to fill with the color. Make sure the little arrow is pointing to the area you want to fill. If you get the wrong spot or don’t like the color, you can “Undo” by holding CTRL and Z at the same time. Learn that keyboard shortcut–it is a real time saver. Repeat this step for the arms and legs, face and feet. Now is a good time to Save. 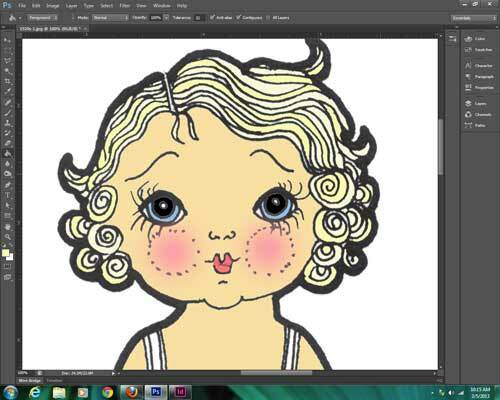 Using the color picker, find a nice soft pink for the cheeks. Then you will click to select the brush tool over on the tool dock. In this image, you can barely see it about 6 tools down, slightly darker than the others. 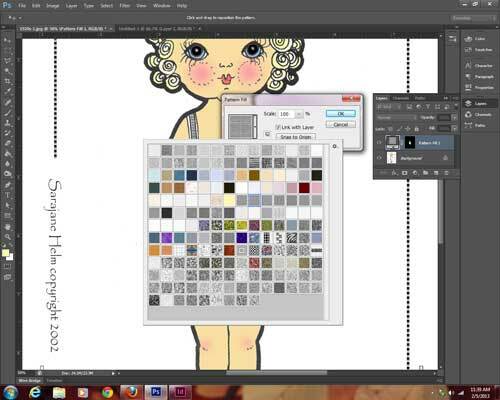 On the top tool bar, as shown in the next image below, click to open the Brush Preset Picker. For the cheeks we want a soft brush, and click the fifth spot in the top row “soft round pressure opacity” shows when you hover over it with the cursor. The size should be slightly bigger than the space I want to fill, and I can see this when I hover my cursor over the image. By setting the size to 178, it is slightly bigger than the cheek area. Click once to apply the color. Because the brush is “Soft” it spreads out and diffuses the color towards the outside of the area, with color concentrated in the middle. Hard brushes have equal color application all over. You can change brush sizes or hardness with the numbers, or by moving the slider. OR use the keystroke shortcuts: Bracket left [ makes the brush smaller each time you hit it, bracket right ] makes the brush bigger. This and Undo (which is Ctrl+Z ) are three really useful shortcuts. You can see that the skin and cheek colors are now applied. Next reduce the size of the brush to about 100 and reduce the opacity (also on the top tool bar) to 50%. Click once on each knee to apply. Then change the opacity level back to 100%. Sometimes it is much easier to do small areas like the eyes and the hair if you zoom in on the image, so that’s what I’ll do next. In Photoshop there are often at least 6 ways to get to what you are trying to do. I find that keyboard shortcuts save me a LOT of time and effort. When I want to zoom in, I use CTRL and + hit together. 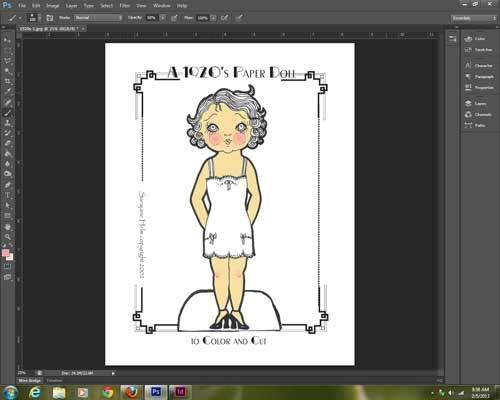 CTRL and – zooms out, making the image smaller. This is true on PCs, but with a Mac, you will use the Command key instead of CTRL. Zoom in on the face, and then select a color you like for the iris of the eye. Use the paint bucket tool and click when its arrow is in the iris, then switch the color to black and fill in the pupil. Do the same thing with the hair color you choose. Use a slightly darker shade for a few of the strands. If you accidentally select the black lines or an area you don’t want, remember that Ctrl Z is “edit undo”, and I often leave my left hand ready to hit that as it can happen a lot! A small spot of white gives the look of reflected light from the eye. You can do this with the paintbrush OR a quick click with the eraser tool. Use a small hard brush and a darker shade of red for the lips. Now is a good time to save again. The shortcut for this is Ctrl S.
Now it is time for her slip! Zoom back out to 50% and using the magic wand selection tool, click inside the slip to select it. Hold down the shift key and click again inside the middle part of each strap of the slip to add it to the selection. You can fill it in with colors in the same way you’ve been using the paint brush or the bucket. Or, you can use Layers to fill it with patterns of all sorts and then recolor those. This part is a bit more complex—but once you master it, it will open up a new world of possibilities! Go up to the toolbar to Window&gt;Layers and click to open the Layers panel. 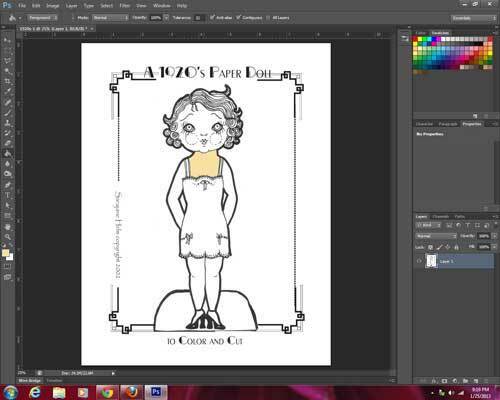 Then click the little black and white circle “Create new fill or adjustment layer”. Click to choose “Pattern”. The Pattern Fill panel shows one pattern and a scale slider for changing the size of the pattern within the selection. There are more patterns in there, too–lots more. If you click the little triangle to the right of the pattern that is shown in the Pattern Fill panel, there is a drop down menu showing lots of squares. Some are colored, some black and white, and all can be recolored to anything you choose, but that step comes later. There are still more patterns that open up if you click the wheel at the to right corner of that new menu, you get another menu with some great options, including one of making your OWN patterns to use! For now, you have 11 more groups of patterns available at the bottom of the menu, starting with Artist Surfaces and ending with Texture Fill. That gives you more than enough to work with for quite a while. Click on one of the choices to open the group. I like to add them all onto one menu because I’m very visual and want to see all my choices without having to browse back and forth to different group folders. A menu opens up and gives you the options of Replace, Cancel and Append; click to choose Append and this adds those pattern options to the one group you already have open. I go through and do this with all of them, but you can do that another time. Sometimes there can be too many choices! Here’s the full set of pattern fill choices appended together. I made the box holding them larger by using my cursor held down to tug the little dots in the lower right hand corner of the box. You click on a pattern to choose it. To get back to that box of Pattern Fill choices the next time, double click on the first box in the Pattern Fill Layer (find this under Window>Layers if you accidentally close it). Then click the black arrow again that is to the right of the current pattern. There are some great patterns there already. Here’s how to expand those choices some more! 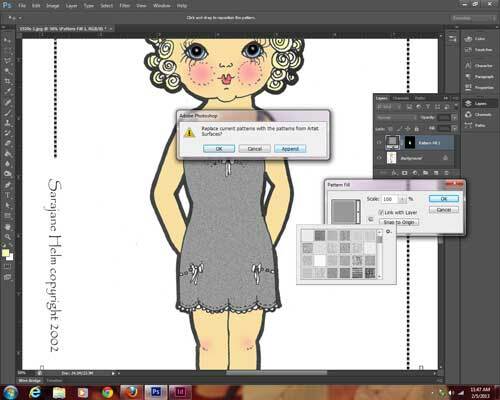 You have two great ways to alter these patterns and the first is by changing the scale slider. Move it forward or backward to make the scale of the pattern smaller or larger. Here I’ve chosen “Gauze” (you can see the names of the texture patterns if you hover over them with your cursor) and enlarged the scale to 367. The number is not so much important–I just slide it up and down until I get a pattern I like and that’s what you can do too. Once you get it the way you want it, click on “OK”. 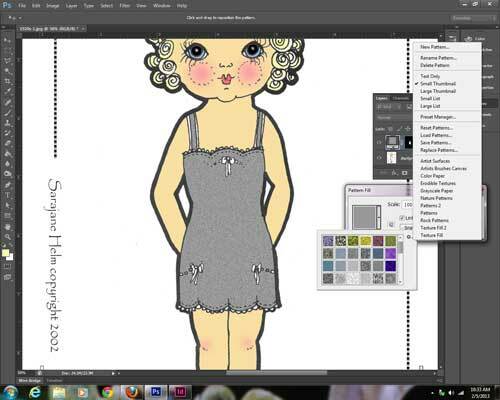 I do like grey, but I want a different color for this doll’s slip. This next part is almost like magic to me! 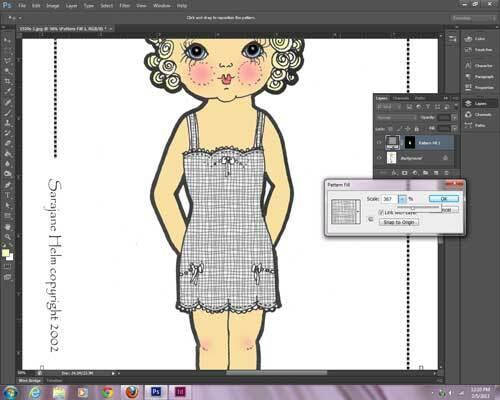 With the layer Pattern Fill 1 selected, click the little black and white circle “Create new fill or adjustment layer”. 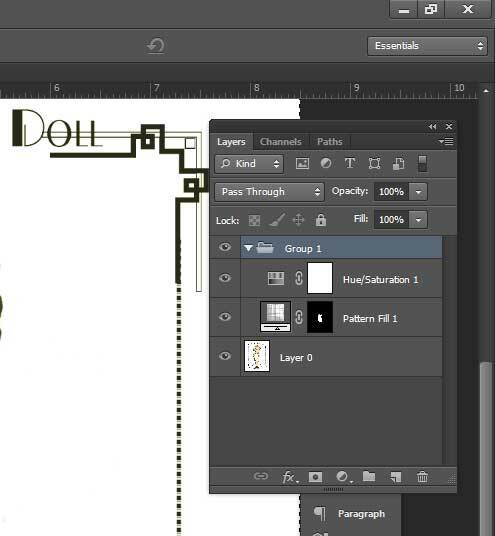 Choose “Create New Group” and then use your cursor to drag the layer Pattern Fill 1 up and release it into Group 1. 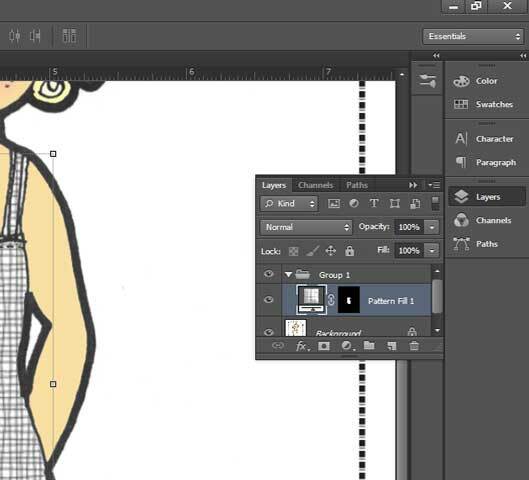 With the layer Pattern Fill 1 selected, click the little black and white circle “Create new fill or adjustment layer”. This time, choose “Hue/Saturation”. Notice that ALL the colors in the image are affected, not just the slip. 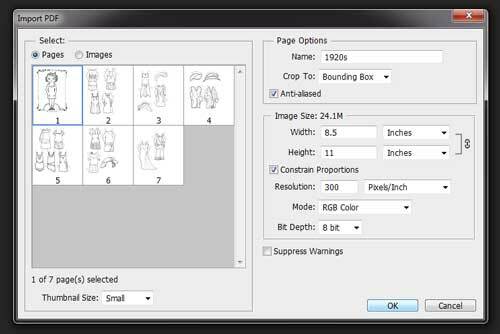 Use your cursor to drag and drop this adjustment layer upward into the Group 1 folder as well. If you don’t do this crucial step, the changes to the color of the slip will affect EVERY layer of the image. The Blending Mode options are on the Layers Panel on the left, third row down, and the one that is showing is “Pass Through”. Click the little triangles to the right of it to open the menu for the other options, and click to select “Normal”. Go back to the layer Hue/Saturation 1 in Group one, and double click on the first symbol on the left to open the options menu. In the middle a small box that says “Colorize”. Then, play with the sliders to change values in Hue, Saturation and Luminosity. When you like what you’ve got, save your work again, this time as a.psd file with the layers included. Print it out and see what you think. 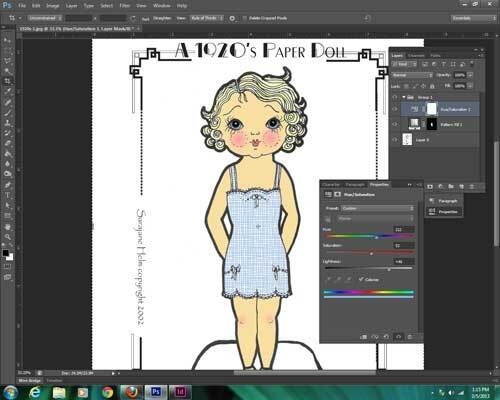 Come back, open your the .psd file and Save As Doll-Version-2, and you can change the various colors and patterns to make her a sister/friend–they can share clothes! Or, start over with the original file and do it again from the start making different choices. You can use these same techniques with images you draw and scan. 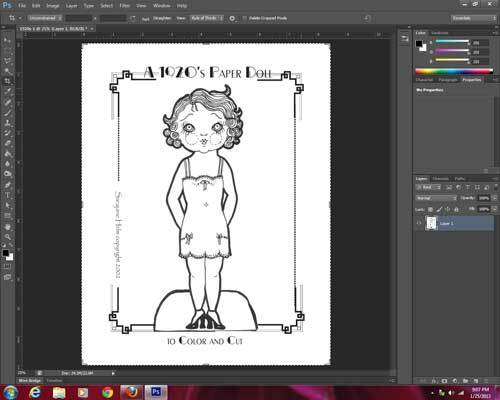 My black and white paper doll .pdf files are also available for purchase and instant download from my Creative Connections Etsy store.